Get The Best Service at the Best Rates Possible. Lincoln Nebraska is home to some of the most amazing trees and landscaping in the entire continental United States. We take pride on our home beauty and ensuring that we have the very best representation of who we are and what we strive to be. That pride comes with care and pruning on regular occasions, and unfortunately it may even include removing a dead tree or obstruction caused from a storm. No matter what your situation is, Blue Ox Tree Service is standing by to help you ensure your home is beautified and protected. Tree stump grinding services can do a lot for a property. Few things are more cumbersome and and annoying than a giant tree stump in the middle of a yard. Lincoln tree care service companies aren’t created equal, so finding and selecting the right one for you and your home is a big decision. We here at Blue Ox Tree Service get that. Tree trimming is more than just removing dead limbs, stump grinding, and falling trees. It's about beautification and protection. Eddie & crew just finished trimming a large beautiful linden tree between my house and the neighbors. It was needing a radical trim to prevent potential damage from falling branches; yet, I didn't want to lose the shade or aesthetic beauty that the old girl provided. It is done and looks perfect! My input was respected from the point I received an estimate, to the moment they left after completing the work. Excellent care was taken to protect both my neighbor's property as well as mine. Cleanup was done well and they even offered to pick up branches not related to the job. Another appreciated aspect of the service was watching how well the crew worked together. You can tell they have respect and trust for each other. In this day and age, that is wonderful to see. Thank you, Eddie and Crew (Tim, Terry & Travis). Job well done -- you are all highly recommended. Ed was fast to come out and give me a quote, the price was great by comparison to the other estimates that I received. He kept me well informed on the when him and his crew would be out to do the work. Everything they did was above and beyond my expectations. The crew were all nice, knowledgeable about what they were doing and kept me in the loop on what they were doing. When they were done they cleaned up all the debris. If I could give them more than five start I would. Eddie and his team were great to work with. We received a prompt and honest estimate with great recommendations for our Lilac bushes and Locust trees. The work was done quickly and they cleaned up as if they had never been there. Excellent work and I highly recommend them to anyone looking for this type of work. We'll be sure to use them again when the time comes. Great company to work with. Received a reasonable estimate from Eddie and his team showed up to complete the work when he said they would. Would definitely use them again in the future. Fast and friendly service with my tree trimming needs. Called on Friday, trees trimmed Monday morning. And I'm happy with the cleanup afterwards so that I'm not stuck raking up the twigs out of my yard. I had Blue Ox Tree Service trim 3 trees that had storm damage and needed further trimming. Eddie was great to work with and quoted a price that was better than One Life's. The crew did an excellent job of cleaning up after they were done. I will be recommending Blue Ox to anyone else in need of tree service. 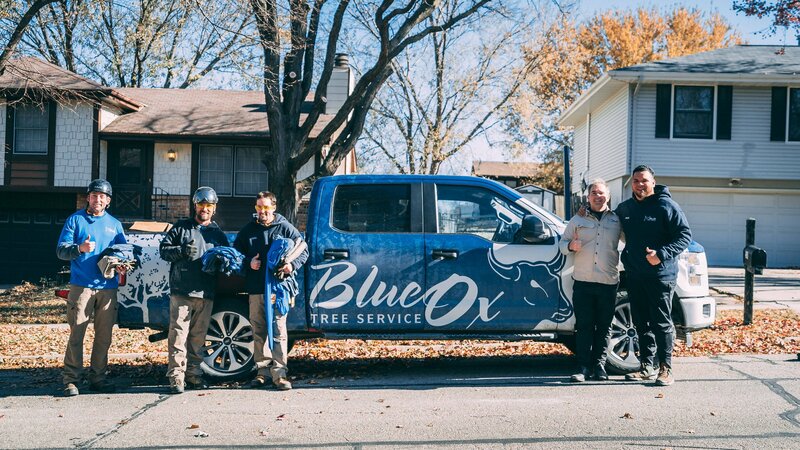 I had a wonderful experience with Blue Ox Tree Service at the beginning of November. A branch had broken over my house with the snow storm in October. I had reached out to two other companies and never heard back from them. Third time was the charm. He called me back and due to the explanation of the branch resting on my house, he came over right away. I explained to Eddie what I needed and asked what he recommended in regards to the overall branch hanging over the house that had part broken. He also pointed out other limbs that he felt would be a good idea to have removed and why. They were at my place a couple hours later and by the time I got home, the work was done and cleaned up. He sent the bill via text, email and mail, which I really appreciated. The service has always been quick and beautiful. Eddie and his guys are great at what they do. I recommend them above other tree service companies in town! I am very happy with Blue Ox. They are professional and courteous. I was at ease knowing that they knew what they where doing, no one was going to get hurt and nothing will be damaged. And they did a great job cleaning up after themselves. I will recommend Blue Ox to my friends. Professional, quality service. I called after the early snow storm damaged my tree. Even with the increase in requests, they were prompt to return my call, prompt to come out for an estimate, prompt to complete the work. Their price was competitive, the work was done correctly, they thoroughly cleaned up and were even nice enough to get the loose branches off my roof that had fallen during the storm. Another place I called made me feel like they were doing ME a favor and I felt like I was an inconvenience to them. Blue Ox made me feel valued as a customer, highly recommend their services!